Young children develop skin rashes from a variety of causes including skin irritations, allergies, fevers and bacterial or viral infections. Seek immediate medical attention if a rash is accompanied by a fever above 103, a sudden change in alertness or difficulty breathing. Most rashes are mild but should still be evaluated by your child's physician at a routine exam. The chickenpox rash is caused by the varicella-zoster virus. The lesions are generally found on the face and trunk area first and then spread to the legs and arms. They start out as red flat spots before becoming raised, fluid-filled bumps and eventually developing a crust. The chickenpox rash is very itchy and may be accompanied by a mild fever. Typical outbreaks last up to two weeks. Rubella and the measles are not directly related. The measles are caused by the rubeola virus. The "German measles" are caused by the rubella virus. Measles start out around the face and neck, with more severe cases spreading to the chest and lower body. Rubella also starts around the face and neck but spreads quickly and easily to the rest of the body. The measles rash consists of flat, irregularly shaped, red areas that become raised. Rubella is a finer pinkish rash that remains flat. Both can be associated with a fever but the measles tend to cause a higher fever and, in general, more complications. Fifth disease, also known as "slapped face disease," is caused by the parvovirus. This rash is generally very prominent on the cheeks with a dark pink-to-red flat, lacy rash that is similar to blushing. This rash often spreads to the trunk and limbs. A mild fever or headache may accompany fifth disease, but generally the rash is the only symptom. Fifth disease usually lasts five to ten days but may reoccur for several weeks. Roseola is extremely common in toddlers and preschoolers. It is caused by two different common strains of the herpes virus. 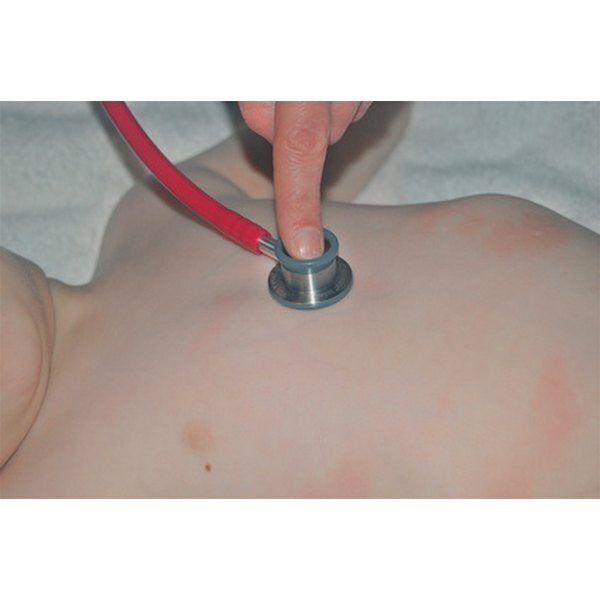 Symptoms of roseola range from almost nonexistent to extremely high fever and prominent rash. The rash usually appears after the fever abates and is generally pink and flat but may become raised. It typically starts on the trunk and may spread to the extremities. The roseola rash is not itchy or painful. Hand-foot-and-mouth disease is typically caused by the coxsackie virus. The infection produces a painful rash or sores in the mouth, throat, hands, feet and sometimes the buttocks. Typically toddlers and small children will run fevers, lose their appetites and appear weak or extremely tired. Symptoms of hand-foot-and-mouth disease generally clear up within ten days. The exact etiology of Kawasaki disease is unknown but it may be caused by a viral infection. Kawasaki disease causes inflammation of blood vessel walls, making it extremely dangerous. Males of Japanese descent have a higher chance of contracting Kawasaki disease but both genders and other genetic heritages can contract it. Symptoms start with a high fever and reddened eyes. After about five days, a red patchy rash develops on the trunk. Usually the throat and tongue turn dark red. The hands and feet may turn purple and swell, and the lymph nodes in the neck are generally swollen. Always consult your child's physician if you have any concerns about your child's health. Only a physician can accurately diagnose a rash or other symptoms and provide treatment options.